One fine sunny day Billie Boy and Gertie Girl went outside to say hello to their two pet rabbits. They stopped to smell some flowers along the way and watched a butterfly flutter by. It was such a lovely day in the garden but when they reached the rabbit hutch it was empty.
" Oh dear. Where can those bunnies be?!?" they both exclaimed. They looked around and saw some birds sitting in a tree. "Hello Birds. Have you seen our 2 bunnies." Billie and Gertie asked. "Oh No" cried Billie and Gertie and they rushed off down the path and around the corner, where they ran into two lovely ladies. "Hello Lovely Ladies, have you by any chance seen our two little bunnies come this way?" Billie and Gertie enquired. "Why, we Did see some bunnies hopping by a while ago. They went down the road and past the colourful flower gardens" The lovely ladies answered, and they pointed towards some beautiful flowery garden beds. Billie and Gertie ran off in the direction that they had pointed. They found their good friend Little Bo Peep wandering along the path. They called out to her "Little Bo Peep, Have you seen our rabbits?". "No I haven't! I've been too busy looking for my sheep!" she replied and then she burst into tears and started crying. "They probably be wagging their tails behind them" added Gertie reassuringly. That seemed to cheer up Little Bo Peep a little bit. And so Billie and Gertie continued on their way in search of the missing rabbits. The next little group they came across was a little group of dogs running around in circles, a smiley cup and a soup pot with some friendly mushrooms. None of them had seen the bunnies but meeting them reminded Billie and Gertie that they were thirsty so they stopped to have a refreshing cup of tea. Along came Mr Cat InATopHat and little Pink Kitten. Billies and Gertie enquired if they had seen their two missing bunnies. "I'm sorry to say, No bunnies have come this way." said Mr Cat In A Top Hat. "What a great Idea!!" cried Billie and Gertie. They bought all the newspapers and read them cover to cover. Although there were lots of colourful stories there was no mention of two runaway bunnies. However they did notice a colourful page that announced the grand circus was in town. Billie and Gertie both agreed that if they were rabbits that's where they would go. So off they went to investigate. The circus was on the other side of the river so to get there they rode their bicycles and then hopped on a boat. Before too long they arrived at the circus. They were greeted by some beautiful circus horses who with a whistle and a toss of their feathery head pieces called over the Ringmaster. "Hello" greeted Billie and Gertie "Our two rabbits have disappeared. Have you seen them hopping around?" "What do they look like?" asked the ringmaster. "Well, If they like to dance, let's play some music and maybe that will entice them to come out of hiding. " suggested the Ring Master. So he called out the circus's finest drummer clown who beat out a catchy, toe-tapping tune on his drum. Out came two lovely long eared bunnies dancing a merry jig. "Yippee" Billie and Gertie, and all the circus folk cheered!!! The runaway bunnies looked very relieved to see their owners. Their story was that they'd just gone for a little wander but soon lost their way and didn't know how to get home. Where they had a delicious dinner and laughed about their colourful, adventurous day. Oh yes you did make me smile! That would be an adorable child's book, think how much fun they would have looking at the hexies to find the characters in the book. You are a clever girl! What agreay adventure . The style of the illistrations reminds me of my early reading books. Love the feed sack fabrics mixed in with everything else. You just crack me up!! Oh My Goodness- you have such a gift for story telling Rachael. And an even bigger gift for sewing hexies . That was absolutely brilliant! Who knew hexagons had such adventures! 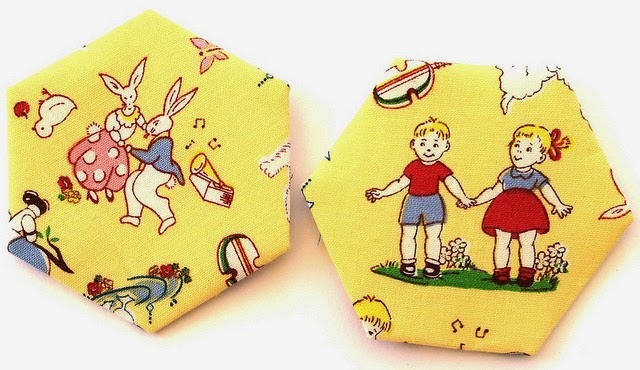 And with hexies, there's always a happy ending. I am so relieved that Billy and Gertie are reunited with their bunnies! Your posts are always the best. Loved the story, adored the hexies. haha ! I read the whole thing ! You're too funny and you have a great imagination. What great fabrics you have Rachael ! What a lovely story to wake up to Rachael....I think Mr Cat in the top hat looks extremely dashing! 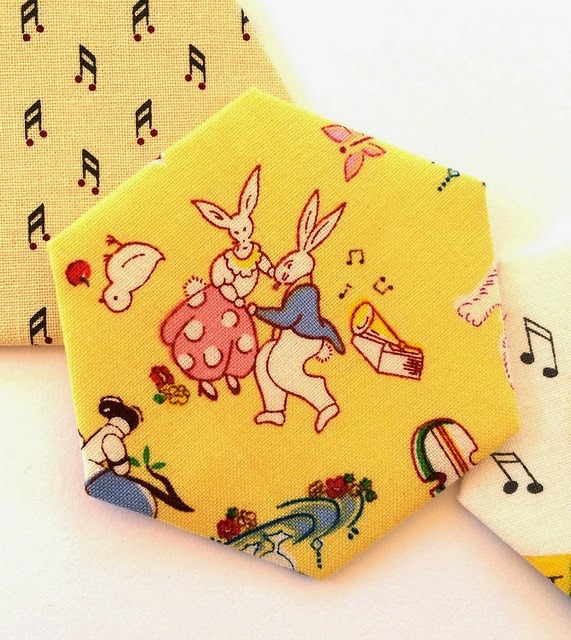 What a delightful story told with your absolutely cutest of cute hexies. Gotta love 1930s prints. Hahaha, great blog post. Its been years since I had a nice bedtime story. Only problem was I'm starting my day at work! 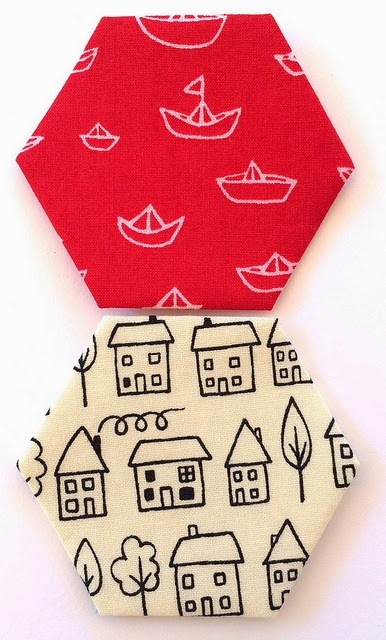 Loved all your fussy cut hexies and the story that went with them! Your story was charming. I'm glad all of your hexies were included in the fun. What a cute story! I really enjoyed reading it, and was smiling broadly all the way through. 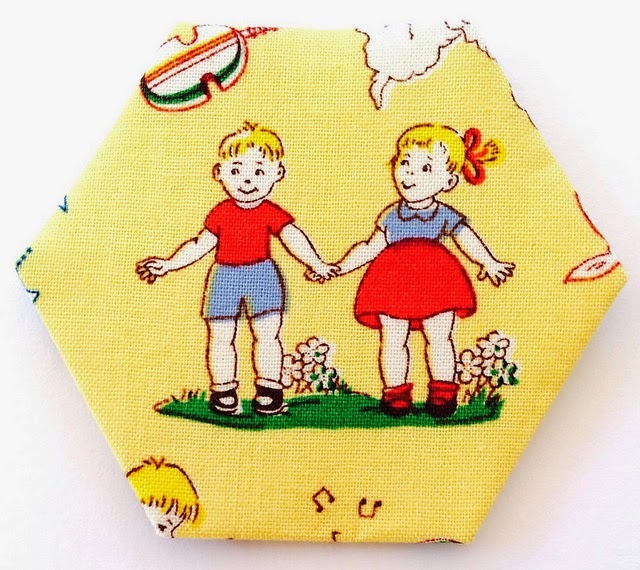 Completely floored that you had all those sweet little pictures with which to make your hexies and your story. One word - PUBLISH!!! That was the cutest post I've seen in a long time, girl, and would make an adorable children's book! Adorable, when are you going to publish it? What a great story - and what fantastic fabrics to make it with. Lovely! What a wonderful tale you told, and your beautiful hexies suit it down to the ground!! I'm all tucked into bed so thanks for the bedtime story. Now I can dream of dancing bunnies! 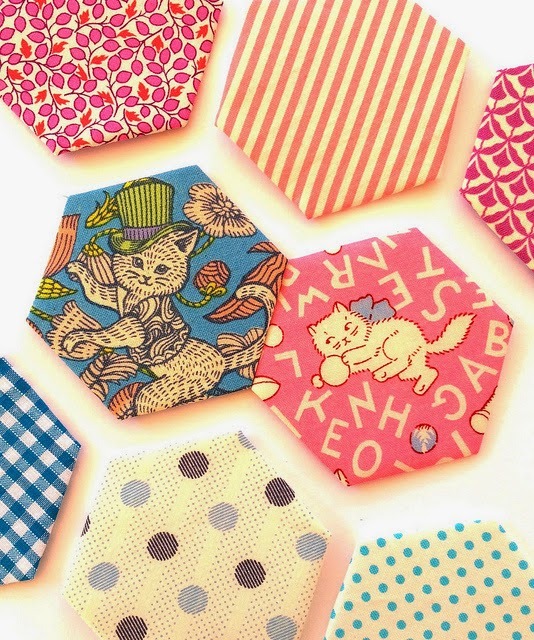 The story is so wonderful and the fabrics are just adorable!! Great story. 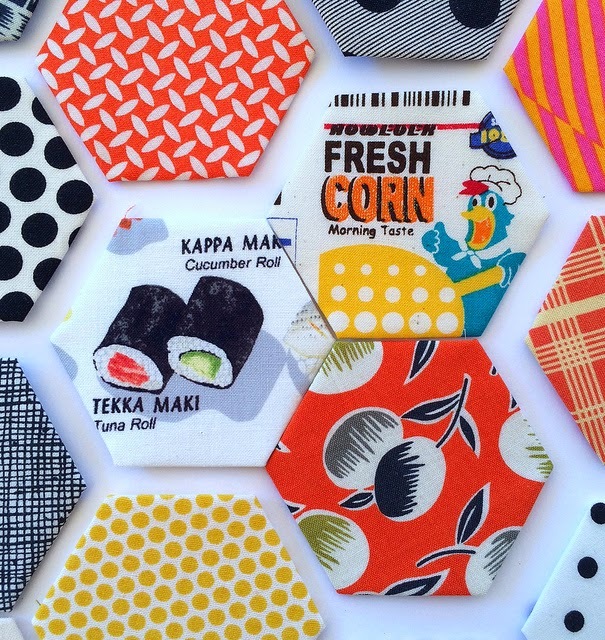 LOVE your 30s print hexies! What a sweet post. Are you going to out them together as a quilt? And write the story on the back? As soon as I started reading this I thought of Kelly Meanix. Yep...she was the first to respond. LOVE IT!! What a great story. You would make a incredible teacher for children! and us quilters as well. I'll have whatever it is that you are having cos it sure is a fun place to be. 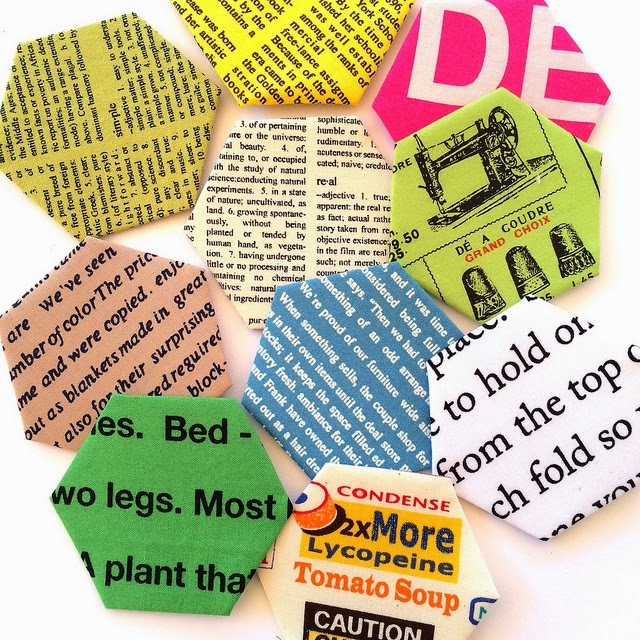 Enjoy your delightful hexagons and the Odyssey they conceal. You've got me so intrigued now about this dilly bag. I was thinking just like Kelly - what an adorable children's book this would be - you could submit it as is! It more than made me smile... you absolutely must try to publish this story. it would make a wonderful addition to any child's library. They'd love it, and it's so informative too with the maths element, and the how to sew element, and how to diagnose a problem and resolve it element, as well as the story. Uou're a superstar, and I love it. Please tell me when I can buy a copy. You are toooo cute -- what a FUN post!!! I see that I am not alone in suggesting that you should write children's picture books! 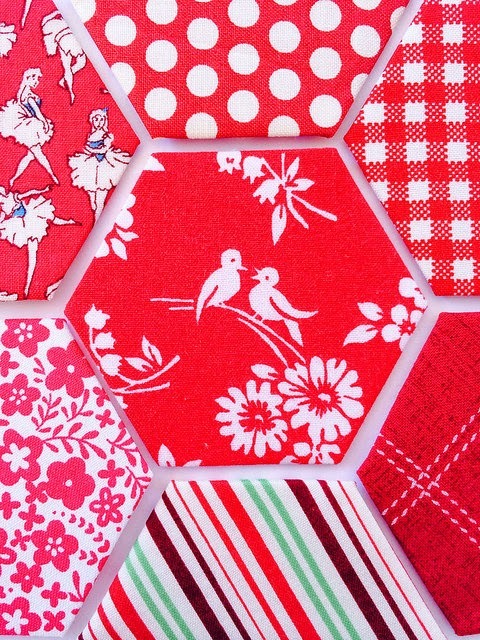 I love all the fabrics - such an eclectic group of hexies yet they look fabulous together. Adorable story, adorable fabrics -- this would be a story book that quilting grandmothers would buy for their grands. You do have a way of brightening up the morning! 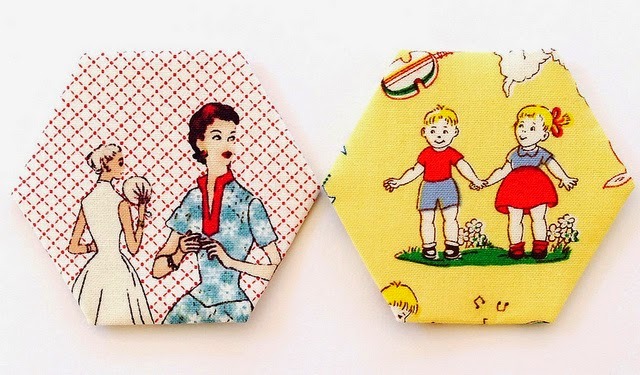 So many cute hexies set to such an adorable story. Thank you for the smiles today! Jam! Had to find out the end of the story :) Priceless, one comment said Publish! and I agree. Love those fabrics. So, so cute! I love all your fun, kitschy fabric! Awesome start to my day! THANKYOU. I agree a story for crafty Nana's to share with their grandies.... But don't leave us to some publishing house! Btw what is the fabric with the saucy puss with green top hat it's sooooo cute. What a gorgeous story! So well told Rachael, you should be in print!! Great imagination. Well, a storyteller as well as an avid quilter! 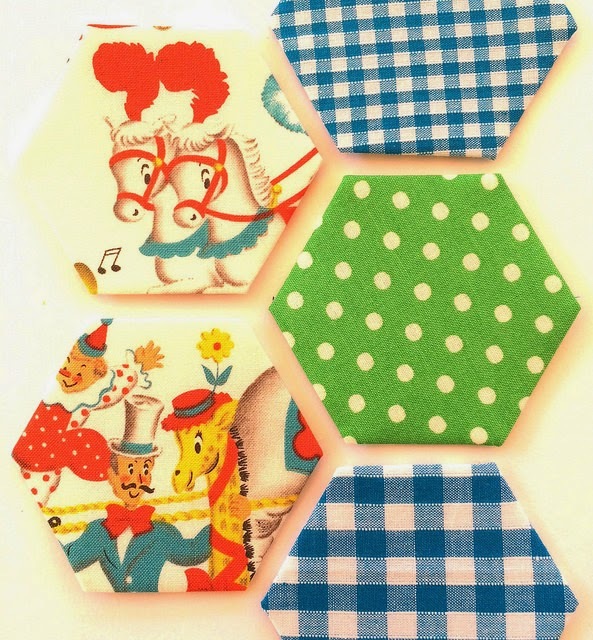 Your hexagons are fabulous: the cute range of fabrics is marvellous. 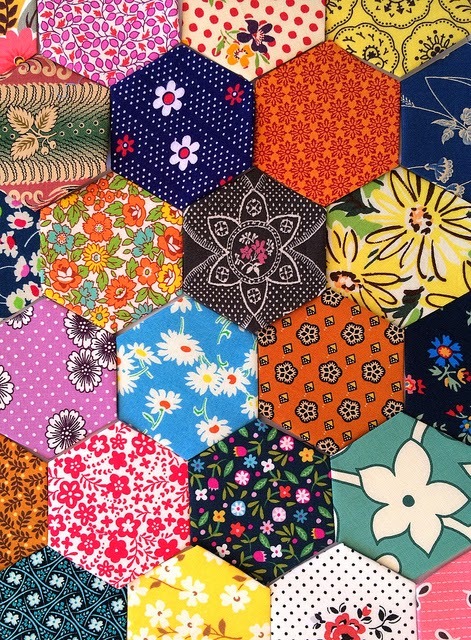 Trying to imagine your stash....... it must be huge for you to be able to cut such an amazing variety for your hexagons. 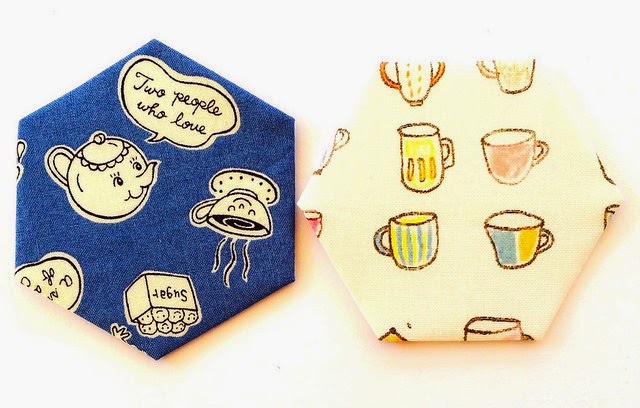 This just made my day--so inventive and your hexies are all so cute. I have a pirate monkey who escaped from a pirate ship. What kind of adventures could he possibly have along the way?? Bella storia...hai un futuro come autore di fiabe! Crazy rabbits! So glad this little saga had a happy ending; you made my day! Oh I love this! 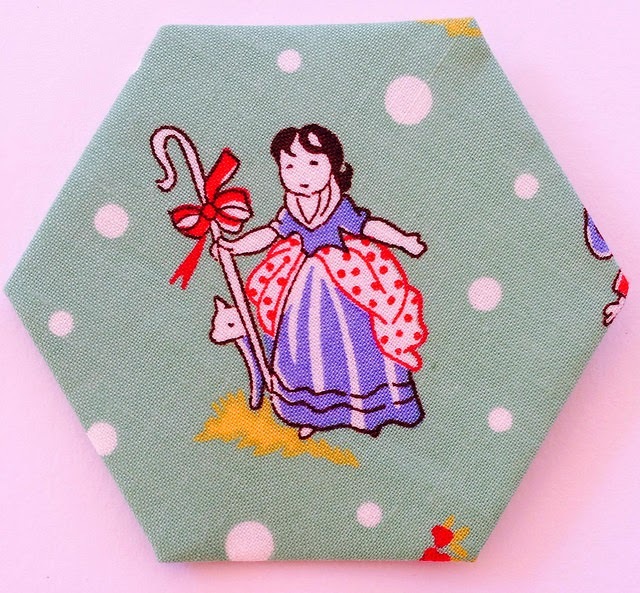 Did Bo Peep ever find her sheep? What a fabulous tale! Will part 2 be to find the sheep? I hope so. While reading the story I immediately thought this could quite easily be a kids book! I really mean that. The hexies are divine. Love your stories. So glad you write them for us. I love your creativity! 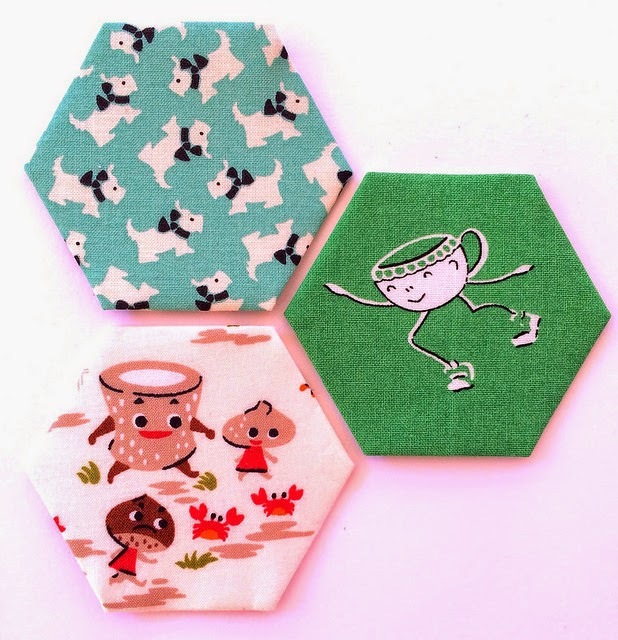 The hexagons and the story are adorable! I am finally catching up. Looks like you have been having a lot of fun while I have been away. 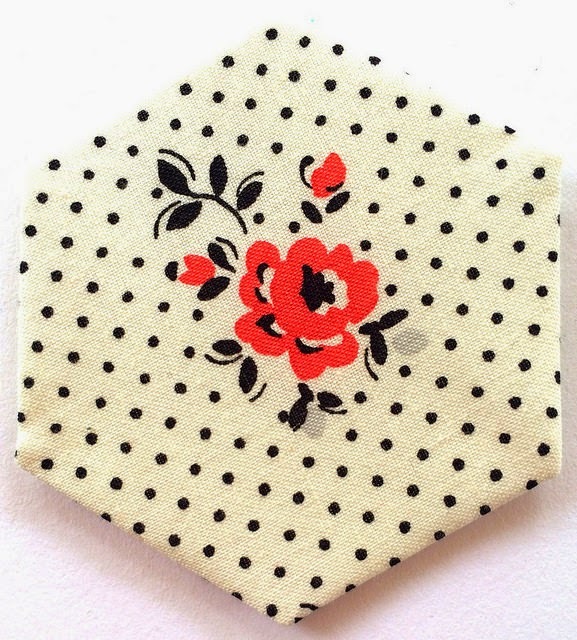 I love your hexie story. Very creative and a gorgeous way to play with fabrics. What an enchanting story. When I was a kid I made scrapbooks with Christmas cards and had fun making up stories with them to. This reminds me of those times. 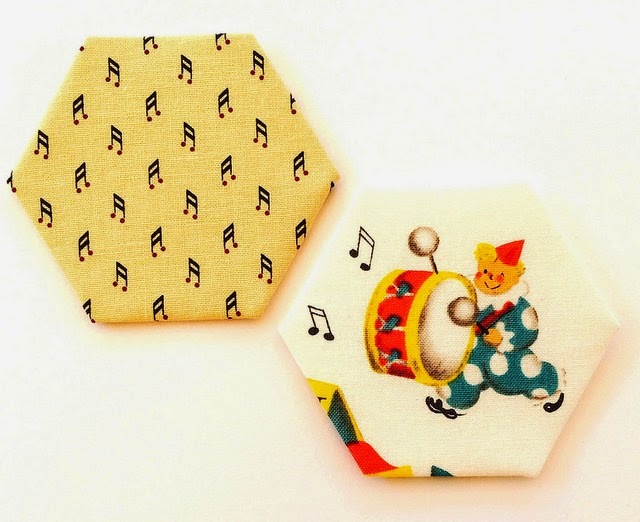 A fun filled quilting storybook post like only you could write (or maybe Kim form SarahLizzies blogspot). Delightful! so happy to take a break from grim to fun and fabric...You r the best. Yep, a big smile. What fun.